Boxwoods made their way from Europe to North America in the mid-1600s, and they’ve been an important part of American landscapes ever since. Used as hedges, edging, screening plants and accents, you can never have too many. Read on to find out how to get plenty of new shrubs for free by starting boxwood cuttings. Not as easy to start as your average garden perennial, boxwood cuttings require a little time and patience. You’ll probably have a few cuttings that refuse to root, so take more than you think you’ll need. Taking boxwood cuttings in midsummer catches the stems at just the right stage to give you the best chance of success. Cut 3- to 4-inch tips of new growth with a sharp knife. Pruning shears or scissors pinch the stems and make it hard for them to take up water later on. Only cut healthy stems with no insect damage or discoloration. 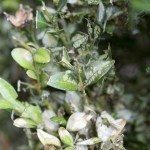 Successfully rooting boxwood cuttings depends on cutting the tips from healthy, vigorous plants. Stems cut early in the morning root best. The medium you use for rooting boxwood bushes should be clean, low in fertility, and very well-drained. Don’t use potting soil, which is rich in nutrients that can encourage rot. If you are going to start a lot of shrubs, you can make your own medium from 1 part clean builder’s sand, 1 part peat moss and 1 part vermiculite. You’ll come out ahead buying a small bag of commercial rooting medium if you are only going to start a few. Remove the leaves from the lower two inches of each cutting and scrape the bark from one side of the exposed stem. Roll the lower end of the cutting in powdered rooting hormone and tap the stem to remove the excess. Stick the lower end of the cutting where the leaves were removed about two inches into the rooting medium. Firm the medium around the stem just enough to make it stand up straight. You can place three cuttings in a 6-inch pot. Place the pot in a plastic bag and close the top to create a moist environment for the plant. Open the bag daily to mist the stem and check the soil for moisture. After about three weeks, give the stem a little tug once a week to see if it has roots. Once it roots, remove the pot from the bag. Repot rooted plants into individual pots with good quality potting soil. It is essential to repot the plants as soon as they begin growing to prevent the roots from becoming tangled and to provide them with nutrient-rich soil. A good potting soil has enough nutrients to support the plant until you are ready to set it outside. Continue growing the new plants in a sunny window until spring planting time. Growing boxwood from cuttings is fun and rewarding. As you learn to propagate some of the more difficult garden plants, you add an extra dimension to your gardening experience.